Learn about the distance between planets, the phases of the moon, and constellations. -Email parents at least 2 days in advance to let them know that their children will be using (and eating!) 8 Oreos in this program, and possibly Betty Crocker (or whichever brand) vanilla frosting, in case there are allergies. –Draw 10 or more constellations on black construction paper (you do not have to use star stickers–just white dots will suffice) and hang them up around the room. Be sure to label them with the constellation name! -Print out a picture of a finished product from the Oreo Cookie Moon Phases project (like this one). Print one for each participant. -Walk the paces for the Distances Between the Planets demonstration and mark the floor with a piece of tape for each planet. -Distribute frosting equally into bowls (1 per table). –Optional: Make a model of the Oreo Cookie Moon Phase project. –Optional: Label each participant’s plate for the Oreo Cookie Moon Phase project with the names of the phases and/or with a picture of the Earth in the center. 1. Settling in, welcome, introduction to topic. 2. Brainstorm what we know about space. 3. Ask who can name all the planets. Ask them to list the planets in order from closest to the sun to furthest from the sun. Write this on a whiteboard or big sheet of paper so everyone can see it. 5. To make distance between the planets easier to understand, ask for volunteers to do the Distance Between the Planets demonstration. (Note: If you don’t have enough room to do all the planets, explain how many more steps away those planets would be, e.g. how far outside the room, or even outside of the building). 6. Discuss the closest object to our planet: the moon! (distance from earth, orbit, etc) You could also use this time to discuss the appearance of the moon and how craters form on its surface. 7. Discuss how the moon looks different all the time, but it doesn’t really change shape. 8. Watch up to 3:45 on this video that explains the phases of the moon. 9. Reiterate the moon phase terminology they just learned while showing them a photo of the phases of the moon, either from a book or like this one online. 10. 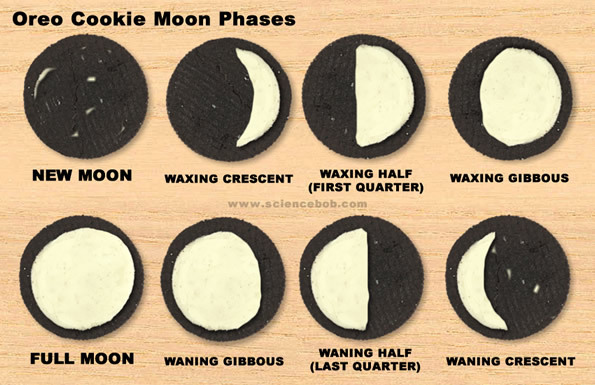 Take 20 minutes to do to this Oreo Cookie Moon Phase activity. See the instructions we gave them under Special Instructions and Procedures below. 11. Take a couple minutes to discuss what stars and constellations are. 12. Use the last 10-15 minutes to do this Constellation Drawing activity. See instructions below in Special Instructions and Procedures. Outer space is cold, bigger-than-big, silent, full of stars, meteors, planets, and moons. There are 8 planets, plus the dwarf planet Pluto. Our solar system exists in a galaxy called the Milky Way, but there are billions of galaxies in the universe. All planets in our solar system orbit the sun. There is no oxygen in outer space, so we cannot breathe. The sun is in outer space. The sun is a star. The sun is HUGE–you could fit a million earths inside of the sun. Things in outer space are very far away from us and from each other. Things don’t weigh much on other planets or in outer space (hence the floating). And so on, and so forth! If your group is on the younger side, the Oreo Cookie Moon Phases project will be more labor intensive for you, as it is very difficult for 1st graders to successfully twist open an Oreo, and to make each cookie look like the picture. 2nd and 3rd graders have little to no problem doing this activity, but 1st graders will probably need a lot of help. To save time, anyone helping you with the program can start passing out materials while you explain the instructions. 1) You can use your knife to move some of the frosting between sides of the Oreo if it gets a little messed up. 2) The bowls of frosting should be used like glue. You will put it on the back of the Oreos that you stick on the plate. The frosting is not for eating! 3) Your goal is to make the Oreos on your plate look just like the ones in the picture at your table. 4) Yes, you can eat the halves of the Oreos that you don’t use. Use the instructions from Share and Remember’s blog post to direct this simple activity. We pointed out the constellation examples that we’d made and hung around the room, and told them to choose whichever one they liked best to copy onto their paper. NPS.gov: How Far Apart are the Planets? Ask an Astronomer: How Far is Each Planet From Earth? Space.com: How Big is Earth? I Can Teach My Child: Why Are There Craters On the Moon? For starters, make sure you don’t pronounce “Uranus” as “Yer-AY-nus,” as many of us were taught to in elementary school. Nowadays, kids are taught to say “YOOR-ah-nus.” If you say it the way you have always known it, you will elicit cackles of glee and a hefty distraction overall. They might still laugh, but I’d say it’s less likely. We only had one printout of a completed Oreo Cookie Moon Phase project per table–this was a problem. It was very difficult for the 1st graders to understand without a model to copy. Therefore, it’s imperative that you print out one per child and tell them do exactly what the picture shows. That being said, it’s unlikely that we would attempt the Oreo Cookie Moon Phase project with this age group again. It’s an awful lot of work for them, and it seemed to be particularly confusing for the bulk of our 1st graders. Instead we might opt for this (potentially messy!) activity about craters. We might also consider trying this interactive moon phase demonstration if we could sufficiently darken the room. Please see our blog post about an outer space-themed STEAM storytime for 3-6 year olds and their caregivers. For a 4th-6th grade (or possibly middle school) audience, NASA has several good projects, including: a more math-intensive activity for measuring the distance between planets, building a model satellite, designing and building a model spacecraft, understanding components of a mechanical system, or a group activity involving the stars.